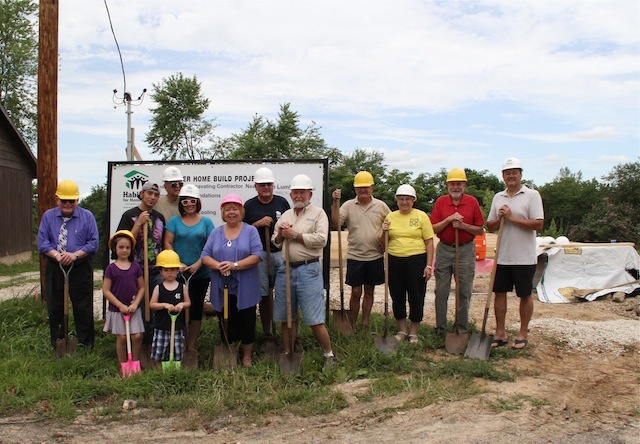 Pictured left, Habitat for Humanity of Franklin County board and future homeowners of the 205 Orchard St. home at the site of the home during the official groundbreaking ceremony, July 13. NEW HAVEN, Mo. - Habitat for Humanity of Franklin County held the groundbreaking ceremony for the new home being built at 205 Orchard Street in New Haven, at 1:30 p.m. on July 13. Holly Pohlmann, the future homeowner of the home, said the house should be finished in the fall. Pohlmann said the process has been exciting and emotional, but she and her family are very grateful and are looking forward to living back in New Haven and having a home of their own. NEW HAVEN, Mo. - Are you ready for summer? Just in case you didn’t know it, it started officially this week. Unofficially, it started several days ago. Hope you are keeping cool, especially our Seniors. If you are having trouble paying your electric bill, let someone know. I shouldn’t have said anything a couple of weeks ago about not having any death notices. Since that time, we have several. Timothy Unger passed away on June 3rd, Peggy Klott, June 8th; James Rouse, June 9th; Elfrieda Allersmeyer, June 13th, and Kenneth Alberswerth June 18th. Our thoughts and prayers to all of the families. 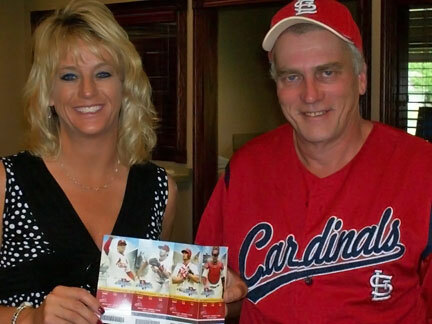 We still have gift cards available for purchase. Buy them for family members or friends. Perhaps someone would come if they were given a lunch ticket. Pictured: The foundation for the home is already in place, now Habitat needs your help to build the house. 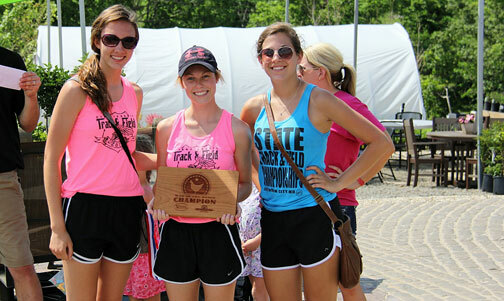 Pictured (left to right) The “War of the Wings” Taylor Covington, Molly Munsinger, and Beth Schenck, which could not have been more fitting that the “New Haven Track Team” were this year’s champions especially since 100% of proceeds were donated to the New Haven Community Track Project and the Franklin County United Way. WASHINGTON, Mo. - Saturday’s “War of the Wings” backyard barbecue wing contest was part of Scheer Landscape Company’s Bloom ’n Que Customer Appreciation Day. NEW HAVEN, Mo. - What are Shamrock Days? 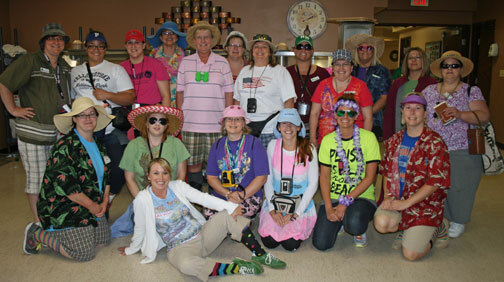 This will be a celebration at Camp Trinity very much like our past Family Fun Days. In an effort to share our mission we have renamed our annual event. New Haven, MO is well known for its shamrock and Camp Trinity nearly 25 years ago began using it on their cross for the sign of the Trinity as St. Patrick did many years ago. It was in one of his sermons in which he picked up a shamrock and held it before him to illustrate the doctrine of the Trinity, three in one and one in three. It is with great excitement to announce that Scheer Landscape Company will be hosting their Bloom ‘n Que, Customer Appreciation Day on Saturday, May 31, 2014 as a way to celebrate their success and interact with the community. 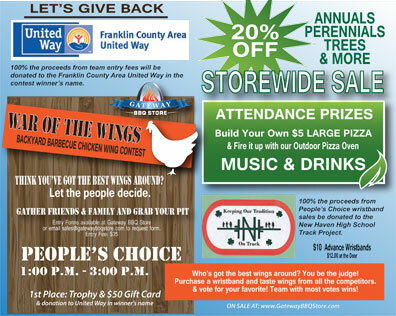 As a part of the Bloom ‘n Que event, they will also be hosting a “WAR OF THE WINGS” contest to benefit Franklin County Area United Way and New Haven High School’s Track Project. Hot, Sweet, Spicy, or Saucy… any way you want to grill ‘em. They are looking for backyard cooks that think they have the best chicken wings around. Pictured left to right; David Otten 2nd place winner, Logan Burkett 3rd place winner and Octavia Straub president of the Resident Council at New Haven Care Center. Not pictured Landen Kriete 1st place winner. Photo courtesy of New Haven Care Center. NEW HAVEN, Mo. 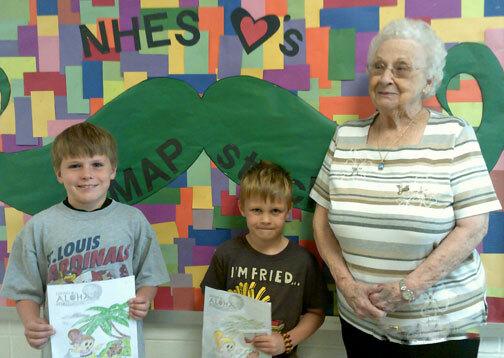 - Recently the New Haven Care Center held a coloring contest for children in grades K-3 at New Haven Elementary School.